The Sketchy Reader: If It's Monday, It Must Be Red Beans and Rice Day! If It's Monday, It Must Be Red Beans and Rice Day! So you might be wondering why Mondays are red beans and rice day? Mr. Art @ Home is from New Orleans, and everyone does laundry on Mondays. Seriously, there is reduced water pressure city-wide on Mondays! But before the first load is put into the wash, red beans are put in the pot to cook slowly all day long while the laundry is being done. If it's Monday, it's laundry day! Mr. Art @ Home loves Camellia brand best! 1. Wash, sort, and rinse beans very well. Place beans in a very large bowl, and cover with water two inches above the beans. Cover bowl with plastic wrap overnight. 2. Rinse beans really well in a colander. Place rinsed beans in a large crockpot. Add chicken or vegetable broth, and then add water to just barely cover the beans. 3. Chop onion, peppers, and celery. Add to beans. 4. Add meat. Chop first, if needed. You don't need to add meat if you prefer to keep it vegetarian. 5. Add two to three heaping tablespoons of cajun seasoning, or to taste. Other seasonings can be substituted. Stir all ingredients well. 6. Set crockpot to high and cook for 6 hours. Reduce heat to low and keep on low until time for dinner. Some cooks remove two cups of the beans mixture and puree and then add back to the pot to make the beans creamier. I do this, but it's up to you! 7. Cook enough rice to have at least 2 - 3 cups of rice. 8. Serve one cup of red beans over 1/2 cup of rice. Red beans freeze very well, so freeze the leftovers to enjoy later! The holy trinity of red beans: celery, onion, and peppers. The red beans are under there, trust me. Do you use your crockpot on laundry day? Ricki Jill - My goodness, those embroidered towels brought back memories. My mom did laundry on Mondays and she was from northern Illinois. Thanks for the recipe (and the memory). I think I will try this. Surely seems simple enough for me. This looks fantastic, RJ! I have to try your recipe! We have water limits during the summer as well. We can water our lawns from 8 to 10 in the morning and from 6 to 8 in the evening. I have always wanted to cook this dish and now I have a tried and true recipe! I am not sure which thing I feel worse about...never making beans and rice, or never ironing my kitchen towels! Hello RJ! Oh, we love beans and I have a pot on the stove as I type! We do pinto beans and corn bread a lot around here. 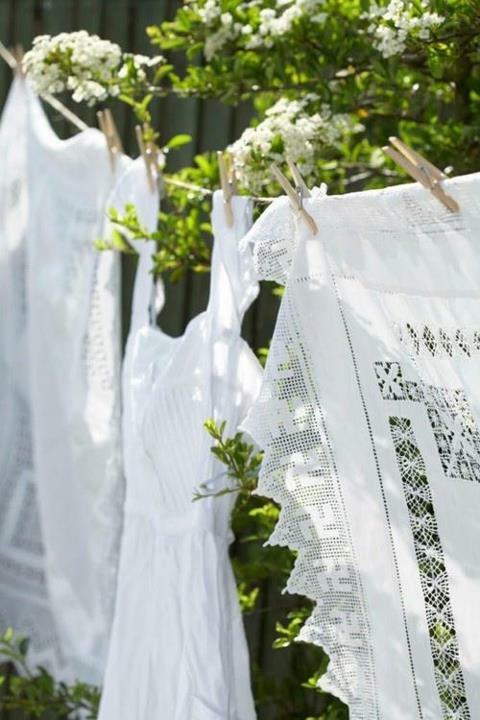 I love that darling little vintage looking embroidered tea towel. My husband would probably love this recipe...I'm fussy when it comes to beans...as in, I rarely eat them. This looks pretty good though, may have to try it. I wish we had a laundry day...I try to get two loads in every day if I can. It's amazing how many clothes my two little rascals go through. Sounds yummy! I actually made a set of those kitchen towels, embroidered with the days of the week and the corresponding chore before The Man and I got married. 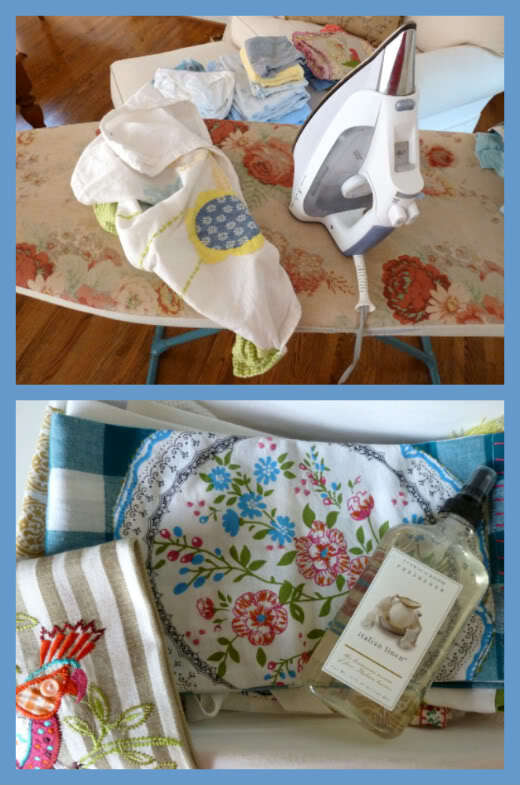 Kind of followed along at first, but I continued to use those flour sack towels until they were thread-bare! I love to do laundry and iron! lol I've made black beans and rice...but not this recipe! I'll try it! I am going to have to put your recipe in sparkpeople.com to see what the carbs would be. I know Todd would love this. I wish I only did laundry one day! Mine is nearly all weekend unless I am lucky enough to get a few loads done during the weeknight after work. I used to have embroider tea towels. Gifts from my first marriage. I left in a hurry and couldn't get them. I really miss them. Very cute! Sounds yummy! Wish I could get away with doing laundry one day a week, everyday is laundry day in this house. I love Wednesday's Bible verse, a bedrock verse for me. I love your new blog look and have loved reading your true confessions post as well as this one. The sweet little bowls are so pretty. I can't resist bowls either. Were the books worth it? You didn't say and I'd like to know before I put them on my list! Now I'm going to try printing out your red beans and rice recipe, hopefully without printing out your whole blog.